Perfect Symmetry: The Search for the Beginning of Time. New York: Simon & Schuster, 1985. First Edition 1/4 cloth AS NEW in FINE DJ 8vo (6-1/2 x 9-1/2), 390 pp including comprehensive Bibliography and detailed Index. Book is AS NEW and DJ is price-clipped, otherwise FINE. Book is hardbound in 1/4 grey cloth on blue boards. DJ is glossy pictorial. The classic in quantum physics applied to cosmology. 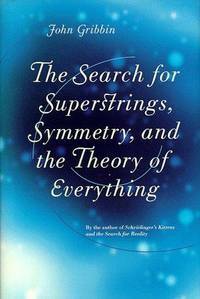 The Search for Superstrings, Symmetry, and the Theory of Everything. New York: Little Brown & Co. , 1998. First Edition, First Printing Boards AS NEW in AS NEW DJ 8vo (5-3/4 x 8-1/2), 212 pp including Index and Bibliography. Hardbound book AS NEW in blue boards in AS NEW glossy picorial DJ. Clear explanations for the intelligent lay reader by the author of "In Search of Schrodinger's Cat," "In the Beginning," and "Schrodinger's Kiuttens and the Search for Reality.